Computational Fluid Dynamics (CFD) is one of the branches of fluid mechanics that uses numerical methods and algorithms to solve and analyze problems that involve fluid flows. At the core of any CFD calculation is a computational grid, used to divide the solution domain into thousands or millions of elements where the problem variables are computed and stored. 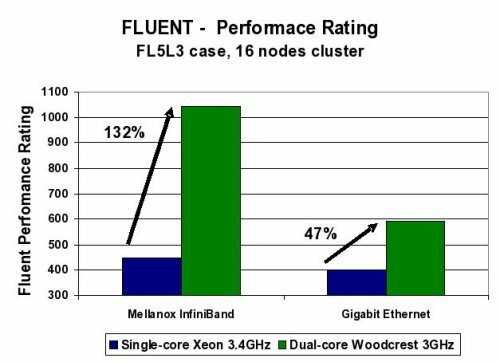 Mellanox InfiniBand delivers superior performance than Gigabit Ethernet - up to 155% higher performance on 128 CPU cores - due to InfiniBandâs proven efficiency and super-linear scaling capabilities. 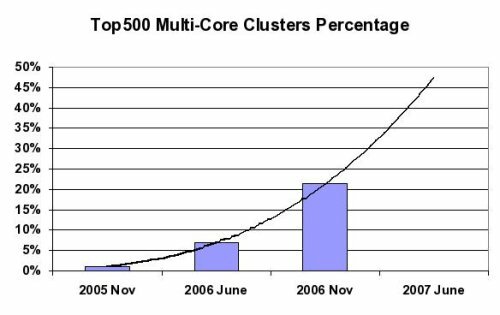 In order to determine the importance of the interconnect architecture for multi-core environments, the same benchmark was used to compare between single-core Xeon 3.4GHz and dual-core Xeon 5100 series 3GHz (Woodcrest). 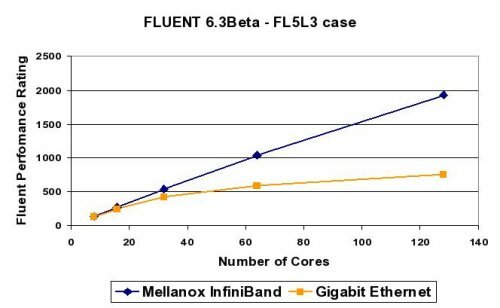 In both cases, InfiniBand shows higher performance, but the difference between Mellanox InfiniBand and Gigabit Ethernet increases on the multi-core setting (See Figure Four Below). In order to meet the requirements of each CPU core, multi-core servers demand higher I/O throughput from the interconnect solution. InfiniBand is proved to provide the aggregate CPU cores demands, while Gigabit Ethernet fails to do so. As dual-core environments introduce higher I/O requirement than single-core systems a high throughput interconnect with low CPU overhead is vital in order to maintain high CPU and application efficiency. 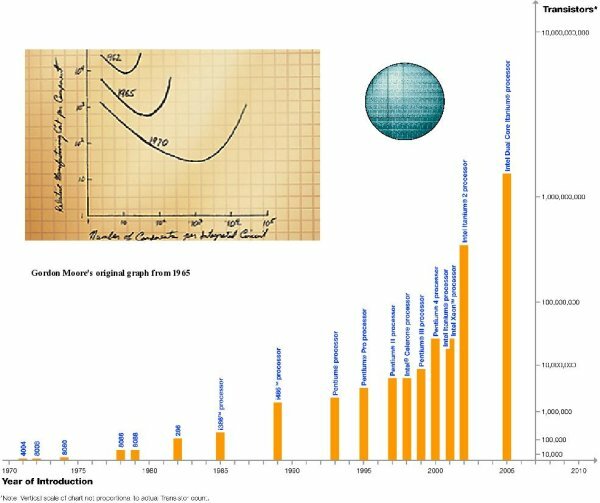 The recent introduction of Intel quad-core environments will further increase this demand. Multi-core environments increase the demand for I/O throughput, low-latency, low CPU overhead, flexibility and high-efficiency in order to maintain a balanced system and to achieve high application performance and scaling. Low-performance interconnect solutions, or lack of native hardware support, will result in degraded system performance. Mellanox high-speed InfiniBand meets the multi-core system requirements and provides a balanced compute solution with Intel multi-core technology. More details can be achieved through Mellanox web site. The author would like to thank John Benninghoff (Intel Corporation) and Lutfor Bhuiyan, (Intel Corporation) for their contributions during reviews of this article. Two other articles, Cluster Interconnects: Real Application Performance and Beyond and Single Points of Performance by Gilad, are also available.